Josh McIntyre (Fullerton JC) had three doubles and four RBI. LINCOLN, Ca. – Both teams went on big runs in this back and forth affair, but the Rogues held on to win, 15-11. The Rogues scored the first seven runs of the game. The Potters scored seven of the next eight runs to get within one run, at 8-7, but then the Rogues scored seven of the next eight and never trailed. The Rogues jumped on the Potters early, scoring five runs in the first inning (all unearned). 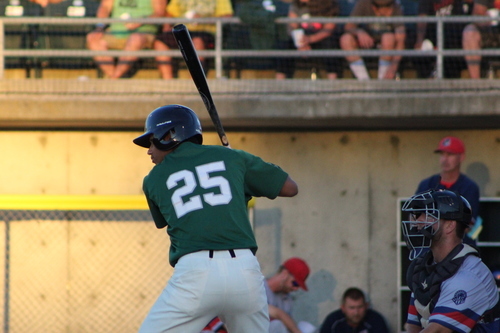 The first big blow came off the bat of catcher James Bell (University of Oregon, 2019), who hit a bases clearing double, and then came around to score on a throwing error by Potters catcher Johnny Pacheco. Relief pitcher Brandon Ross (San Jose State) got out of a few jams by inducing a double play in the sixth, seventh, and eighth innings. The Rogues pitchers did not record a strikeout until the ninth inning, when reliever Gabe Smith (Everett CC) struck out three in the ninth. Riley Kasper (Saddleback College) had five hits in the game, and Josh McIntyre (Fullerton JC) had three doubles and four RBI. The Rogues will travel to Chico to take on the Heat for the first time at Nettleton Stadium this season tomorrow at 7:05pm. The Rogues will return home Thursday, July 19th, for the final Throwback Thursday of the year. The Rogues are honoring the original Medford Rogues, who played in 1950-51 by wearing special Throwback jerseys, which will be up for auction during the game. The Rogues are also throwing back the prices of beer and concessions, including $1 hot dogs, popcorn, nachos, soda, and more. This Friday is another KMVU Fox26 Fill the Park Friday. Fans can visit the following local businesses to pick up FREE tickets for the Rogues next home game on Friday, July 20th.